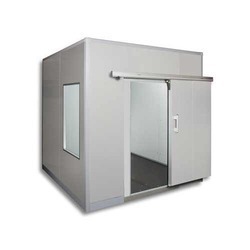 Leading Authorized Wholesale Dealer of modular cold rooms from Chennai. We offer a broad array of supreme quality Modular Cold Rooms that are designed in sync with international norms of quality. Our quality controllers conduct rigorous tests on this range to deliver high quality product at clients' end. These rooms are assembled using quality tested components and the latest technology by vendors' brilliant team of professionals. Moreover, these products are demanded in the market obliged to their hassle-free functionality and low maintenance. Looking for Modular Cold Rooms ?